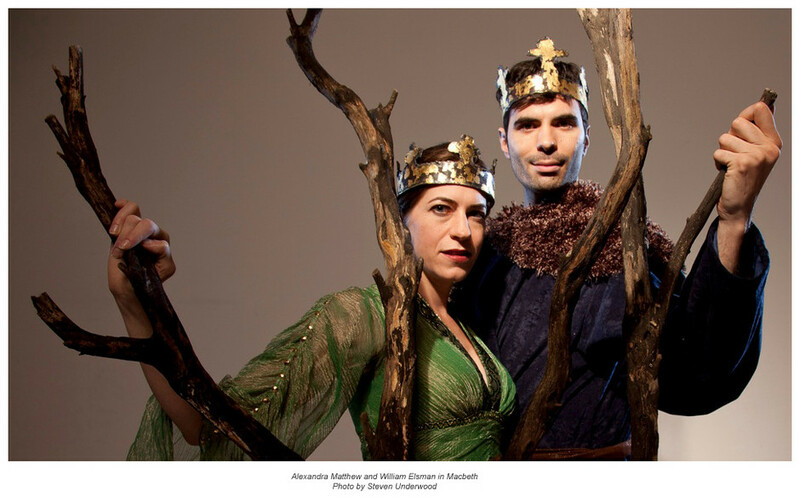 MACBETH IN MARIN: THAT’S ENTERTAINMENT! It’s summer, and for theatre-lovers that means Shakespeare outdoors. We in the Bay Area are privileged to enjoy some outstanding professional companies ranging from the South Bay (Shakespeare Santa Cruz) to the East Bay (California Shakespeare Festival) to Marin (Marin Shakespeare). It’s a feast. This summer began for me with Cal Shakes’ delicious production of Titus Andronicus and now continues its bloody way with Marin Shakespeare’s Macbeth, skillfully directed by Lesley Schisgall Currier who also brought us last year’s thrillingly brilliant production of Antony and Cleopatra. Macbeth is an audience favorite, aptly described as “bloody fun”. Ghosts! Witches! Murder! Battles! Poetry! Comedy! That’s Entertainment! Macbeth is also one of the most philosophically rich plays in the Shakespearean canon, raising profound questions of religion, guilt, morality and destiny. The Marin production (which I DO recommend) succeeds in the “bloody fun” aspects, but is less successful in exploring the play’s moral and philosophical depths. William Elsman‘s incarnation of Macbeth is wonderfully watchable. Here is a Macbeth of great personal charm and athletic grace, who physically towers over everybody else. His size and persuasive puppy-dog charm puts one in mind of motivational guru Tony Robbins, but without brains or moral compass. Many critics have remarked on Macbeth’s stupidity (at least as compared to Shakespeare’s other tragic characters) and Elsman does an excellent job of portraying a man with many gifts but little insight. Alexandra Matthew as Lady Macbeth (clearly the brains of the marriage) partners him well and is consistently convincing as she descends into madness. Artistic director Robert Currier does a star comedic turn as The Porter, appropriately adding contemporary references, clowning directly with the audience and generally making a rousing success of a part that is often funnier in concept than execution. Mr. Currier also greeted audience members at the theater gate, advised on the purchase of refreshments at intermission, and generally played the perfect Porter and host throughout the evening. He is a man of many talents. Young actors Lucas Rudy (as Fleance) and Angelica Zuber (as Macduff’s child) give fine, completely professional, nuanced performances that leave an impression. On opening night, the fight sequences were a bit slow in execution and did not generate the intended excitement, but one hopes this minor flaw will be resolved with further performances. While this production does not plumb the depths of Shakespeare’s thought or fully realize the poetic potential of the play, it delivers solid entertainment. For families who want to introduce young teens (and bright pre-teens) to Shakespeare, it is an excellent choice. Posted in Reviews.Tagged Alexandra Matthew, Angelica Zuber, Leslie Schisgall Currier, Lucas Rudy, Macbeth, Marin Shakespeare, Robert Currier, William Elsman.